Cities Connection Project | 36 SOCIAL HOUSING. LA MINA, BARCELONA. 36 SOCIAL HOUSING. LA MINA, BARCELONA. The project is part of la Mina Neighbourhood Renewal Plan. 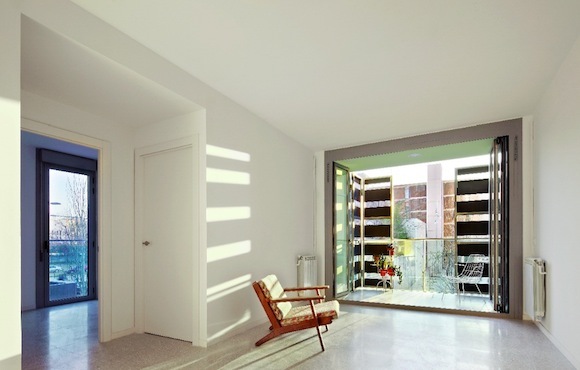 The goal was to achieve the maximum sunlight as possible for all apartments so that that least 80% of the houses have one hour of sunlight between 10,00h and 14,00h during winter, as well as to maximize activities on the ground floor to potentiate the passage, and to increase the life2and relationship with the outside through a terrace of 5m per apartment. We propose 16 houses of 55 m2 (44%) and 20 of 62 m2 (56%) with two stair cases. The plan is organized by a central band that concentrates all facilities, wet areas (bathrooms and kitchens). BALCONY+GALLERY = EXTERIOR ROOM: The Gallery has two parallel sets of folding doors which make it possible to include the gallery into both the living room and to the balcony or disappear to form part of a single space. This ambiguous and reconfigurable space adapts to each family and season, turning into a green house, a summer dining room or a totally exterior living room. At the same time it introduces constant variations in the façade.